The best pancake recipe is the one where you finish every last sweet, sticky pancake mouthful, no matter how full you feel! Whether you prefer savoury ham and brie crepes, or sweet honey and fruit topped British pancakes, you can whip up a basic pancake recipe in just a few minutes. Pancake recipes are homemade fast food! Pancakes have been around for centuries, right back to ancient times, across the world. From sultana laden Scotch pancakes to French crepes served with ham and cheese or chocolate and banana, two things that all pancakes have in common is their preparation and cooking in a pan, and their delicious taste. Thin British pancakes are a must-have on pancake day each year. A day with religious significance. Historically, pancakes were eaten on this day as a way to use up perishable foods (including eggs and a range of fillings) before lent. Today, pancake day is a time to celebrate and feast on a stack of delicious pancakes! For a pancake recipe easy to do yet unbelievably tasty to eat, American pancakes are the winner. These fluffy pancakes are closer to cakes than crepes. They rise in the pan to create a fluffy, filling centre. Most commonly eaten at breakfast, there’s nothing to stop you enjoying a huge stack of pancakes dripping in butter, or with a simple squeeze of lemon and shake of sugar, at any point during the day. For most cakes and sweet baked goods, it’s essential that you use unsalted butter. For pancakes however, the choice is yours. It’s the American tradition to top your stack of waffles or pancakes with crispy strips of streaky bacon and a generous helping of maple syrup. Whether you like the salty n’ sweet combination, or prefer to keep things healthy with low-fat, low-salt butter (and a handful of fresh strawberries, of course) try Lurpak spreadable. Our favourite unsalted, salted and slightly salted butters are available. No more agonising waits for the butter to melt when you can spread it all around and in between your pancakes! Try this vibrant simple pancake recipe to whisk your taste buds away to the tropics, no matter how dreary the weather gets at home! 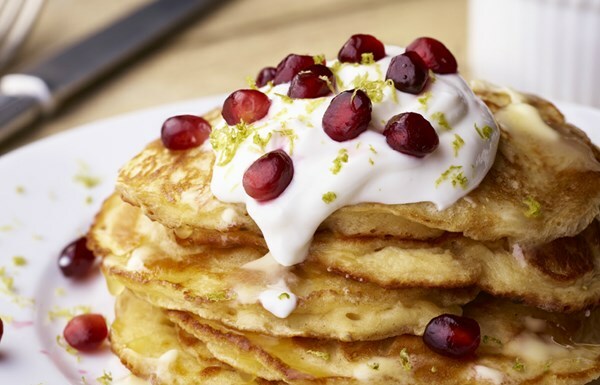 Coconut pancakes with pomegranate and yoghurt sounds adventurous but really, it’s a match made on tropical beach heaven. The sweetness of the coconut pancakes is perfectly balanced with the tang of the pomegranate seeds and creaminess of the natural yoghurt. Next, we have an impressive pancake you can make with home-grown rhubarb. Perfect for impressing guests with an unusual dessert! Crepe style pancakes with rhubarb and rosewater compote combines the delicate notes of rosewater with the sweet sharp flavour of tender rhubarb. 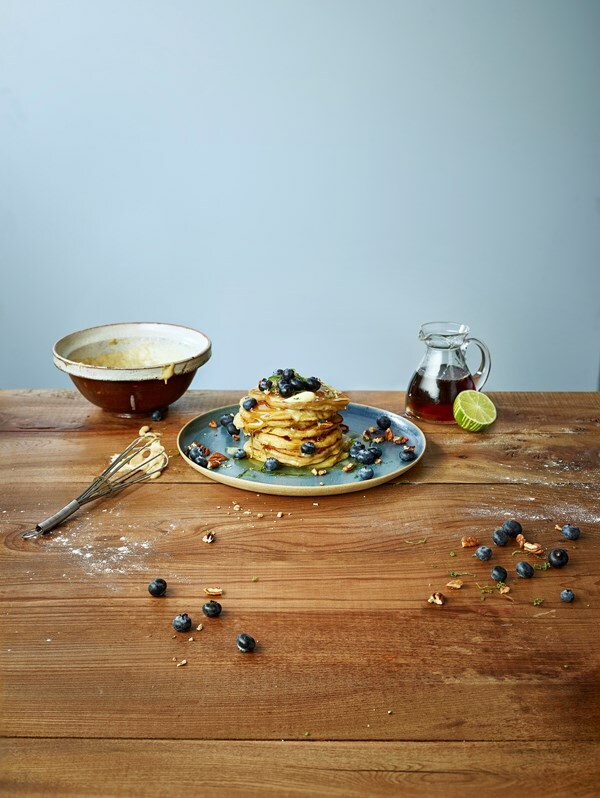 We love how the sweet tartness of the blueberries and lime offset the sweet buttery pancakes in our American pancakes recipe. This masterfully balanced simple pancake recipe combines sweet and sharp flavours with soft, creamy and crunchy pecan textures to create a super breakfast meal.